Likeable comedy that's enlivened by a strong premise, a handful of laugh-out-loud moments and a superb supporting cast. 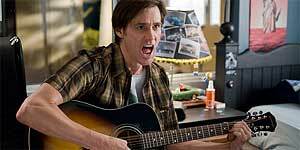 Loosely based on the book by Danny Wallace, Yes Man stars Jim Carrey as Carl, a bank loan manager who's still depressed after his divorce two years ago and routinely avoids contact with everyone, including his best friend (Bradley Cooper). However, an encounter with a former colleague (John Michael Higgins) convinces Carl to attend a seminar run by self-help guru Terence Bundley (Terence Stamp), where he's persuaded to change his life by saying yes to everything that comes his way. Carl is understandably sceptical, especially when his initial attempts leave him stranded on a highway at midnight (after giving a homeless man a lift) or accepting sexual offers from his randy 60-something neighbour (Fionnula Flanagan). However, when one of Carl's disasters results in his meeting free-spirited Alison (Zooey Deschanel), he begins to wonder whether there might not be something in this yes business after all. However, as good as Carrey is, the film's stand-out is Zooey Deschanel, who's both drop-dead gorgeous and utterly delightful as the eccentric Alison, particularly when singing with her band, Munchausen By Proxy. There's also strong comic support from a talented supporting cast that includes Danny Masterson (as Carl's freeloading friend Rooney, who exploits Carl's situation to his own advantage) and a scene-stealing Rhys Darby (Flight of the Conchords) as Carl's nerdy boss Norm. To be fair, not all the jokes work, but the film is charming enough to forgive the odd misfire. Yes Man is a likeable comedy that succeeds thanks to strong comic performances and an intriguing premise. Worth seeing.